Websites related to Oberlin College. We’ve added a second show at 9:30 Club in Washington DC on Thursday, February 7th. The first show is sold out, so don't wait too long to pick up your tickets. Due to a conflict, our show at the Jefferson Theater in Charlottesville, VA has been rescheduled from Sunday, February 10th to Monday, February 11th. All previously purchased tickets will be honored. Tickets are available here. For those of you who have finely attuned pop culture antennae and/or are Punch Brothers completists, the forthcoming Judd Apatow-directed comedy This Is 40 has a soundtrack album that was released today. 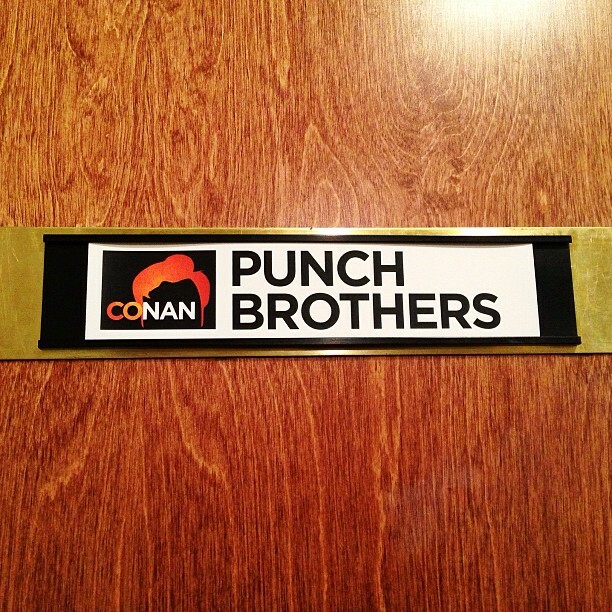 And guess what: Punch Brothers are all over it. The film's score as well as the soundtrack was produced by Antifogmatic producer and old friend Jon Brion. PB can be found on six tracks: Fiona Apple's "Dull Tool," Norah Jones's "Always Judging," Lindsey Buckingham's "Brother & Sister," Graham Parker's "What Do You Like?," Wilco's "I Got You (At the End of the Century)," and last but not least Jon Brion's "Theme 1 (Debbie & Oliver)." Punch Brothers are also featured in other sections of the score, which you can hear by taking a stroll to the ol' Cineplex Stadium 14 when the movie comes out on December 21st. On the live front, our fall tour is nearing its end! We're in Kansas City tonight, Minneapolis tomorrow, and then finish things off in Chicago at the Vic on Thursday (and very few tickets remain for this one). While our three-night New Year's run at The Bowery Ballroom is now sold out (thanks everyone! ), don't forget we have a series of dates with Anaïs Mitchell coming up in January and February. Those of you who would prefer to hibernate through the colder months can come join us in Charleston, SC for our return to the Spoleto Festival on May 27th. Tickets are available here. We'd be remiss if we didn't give Thile and Noam some love for their Grammy nominations! Thile, Yo-Yo Ma, Edgar Meyer, and Stuart Duncan's collaborative effort, The Goat Rodeo Sessions, received a nomination in the Best Folk Album category. Here's a taste of that album if you missed it earlier in the year. Noam's second solo album, Beat The Devil and Carry A Rail, which was produced by Gabe and features many members of the extended PB family, is nominated for Best Bluegrass Album. If you haven't given it a listen, you can pick up a copy in the Punch Brothers Bazaar (and don't forget about our Holiday Sale discounts while you're there). Speaking of Pickles, he has Noam & Friends shows in Albany and NYC coming up next month before he hits the road again on the Banjo Summit. Visit NoamPikelny.com for more details. Before you spend all your online shopping budget, we'd like to bring your attention to our own Holiday Sale! We're offering a discount of 20% off all tees and 25% off our Spring 2012 Tour Poster. There's also a fresh batch of Punch Brothers Flasks in stock for those of you who like to keep your holiday spirits close at hand. The sale, much like our tour, runs through New Year's. Speaking of which, the third leg of our fall tour is officially underway! A big thanks to everyone who came out to see us these past few nights in Vancouver, Seattle, and Bend. We're in Chico tonight to kick off a six-show run in California anchored by our return to Los Angeles on Saturday at The Luckman Arts Complex. We then travel inland with stops in Phoenix, Salt Lake City, Aspen, Boulder, Kansas City, and Minneapolis on our way towards the Vic in Chicago on December 13th. The Milk Carton Kids join us for this entire run. For those of you planning to close out 2012 with us at Bowery Ballroom in NYC, we're excited to announce three artists to join the bill across the three nights: Jeffrey Lewis on 12/29, Aoife O'Donovan on 12/30, and Michael Daves on 12/31. Links for individual tickets and the 3-Day Pass can be found on the tour page. To help get you further into the holiday spirit, you can now stream of our version of "O Come, O Come, Emmanuel" from the Holidays Rule compilation in its entirety here. And just a quick reminder that our new EP, Ahoy!, is available now through many fine providers: our Shop, iTunes, Amazon, and the Nonesuch Store. Today's the day! Our new EP, Ahoy!, is available now! If you pre-ordered through us, you can now access your digital download of the entire EP from the Punch Brothers Shop. You can check out this FAQ if you have any issues accessing the download. For those of you who have yet to take the plunge, there are quite a few options at hand. If you're looking to purchase a physical copy, we'd suggest our Shop where you can still pick up the exclusive bundle (while our supply of Ahoy! tees last) and you'll get an instant download of the EP to tide you over until your order arrives. On the purely digital front, Ahoy! is available through the many fine providers you might expect: iTunes, Amazon, and the Nonesuch Store for you audiophiles (available in FLAC and 320kbps MP3).